Like most people who love travel and tropical paradises, I verily yearn to visit the lovely islands of Hawaii. Especially when my house freezes and plummeted temperatures induce depressions, I pine for the crystal waters and volcanic sand of the Pacific. But one aspect of the islands I have had quite a few run-ins with is Kona coffee. As the only state in the good ol' US of A to mass produce coffee (so far), Hawaii has done a great job in perpetuating a world class reputation for their coffee, as pounds of Kona go easily for $40. But the real truth of Kona's quality really boils down to the crop, the processing and the roaster (...pretty much like all coffee), and as such I've had some great Konas and some not so wonderful. The latest Kona under my proverbial belt is the Kona Fancy from Kona Coffee Purveyors, of which I sampled via pourover, french press and siphon. The pourover dealt out notes of apple with skin, walnuts, pepper steak, a dollop of maple syrup and some pipe tobacco, making for a sweet yet peppery brew with a medium/heavy body. The french press rolled forward with sweeter, supple notes of honey, oats, cocoa, pepper, a little milk, cashews and some nutmeg, proving less astringent and more flavorful than the pourover. Finally the siphon possessed some maple syrup, pepper steak, apple with skin, smokiness, walnuts and a medium/heavy body, almost landing between the profiles of the other two brews with a slight astringency but a strong sweetness. Since I felt that a lot of this coffee's astringent and smoky notes came from the roast level of the coffee, I would definitely be curious of the merit of these beans in a lighter roast, especially since there were also a great deal of positives to the batch. 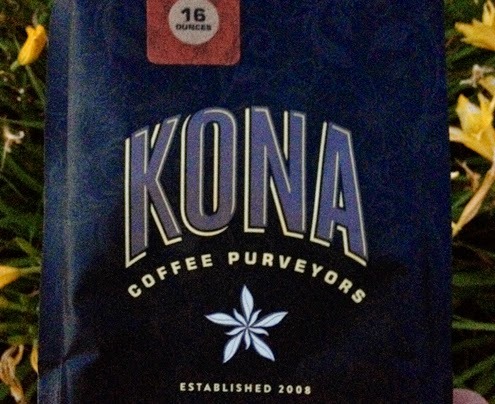 In the meantime, if you would like a sweet, deep and slightly dark Kona, give Kona Coffee Purveyor's Konas a go. Fill in the Coffee Map!